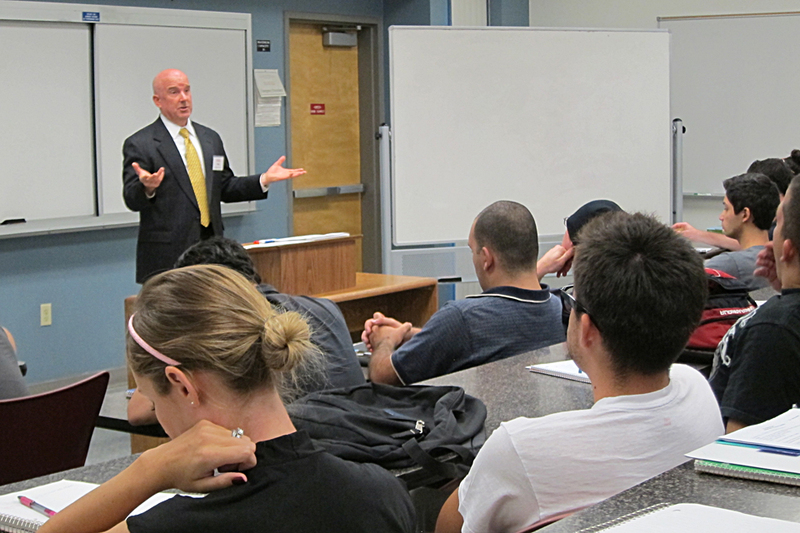 Andy Mandell speaks to a CSUN management class about his personal experience as the chief executive officer of ValleyCrest Development, a landscaping company that completes major projects across the world including in the U.S., Middle East and the Caribbean during the College of Business and Economics annual “Professor for a Day” event on Sept. 19 and 20. Doug Christopher ’87 (Business and Economics), ’90 MBA divulges the story of how he went from working at the local Vons market while completing his bachelor’s degree at CSUN to becoming an economist working for the prestigious Crowell, Weedon & Co., a stock brokerage and money management firm. 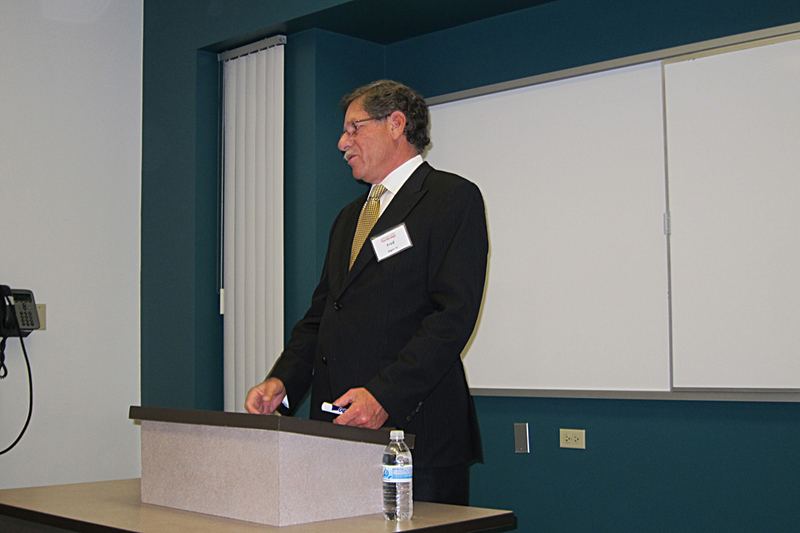 Fred Nigro ’74 (Business and Economics) awes a senior-level accounting class as he speaks of his work at Nigro Karlin Segal & Feldstein, a leading business management firm that represents high-profile clientele like Tom Cruise, Kanye West and David Letterman. 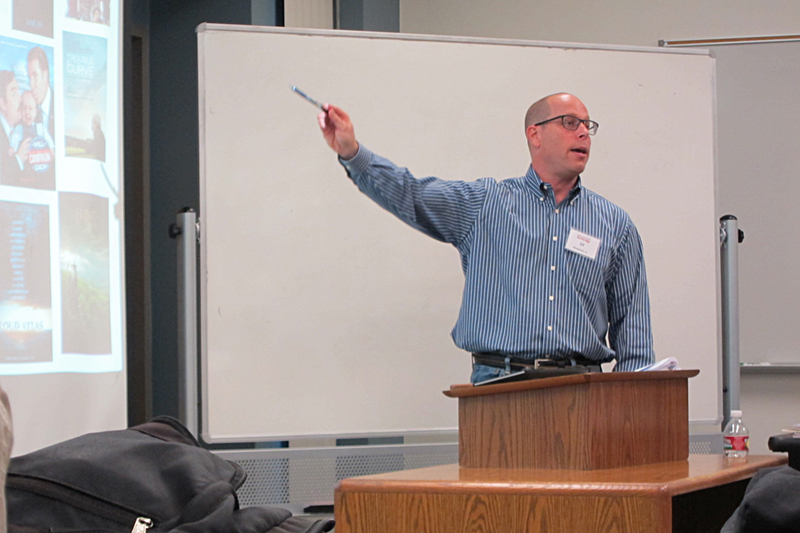 Gil Breakman ’90 (Business and Economics) explains his job duties and responsibilities as vice president of accounting at Warner Bros. to a senior-level accounting class. CSUN College of Business and Economics advisory board member, Ken Floyd ’80 (Business and Economics), describes his job as chief executive officer of Artissimo Designs, a designer and manufacturer of wall décor products sold at major retail chains such as Target and Walmart. 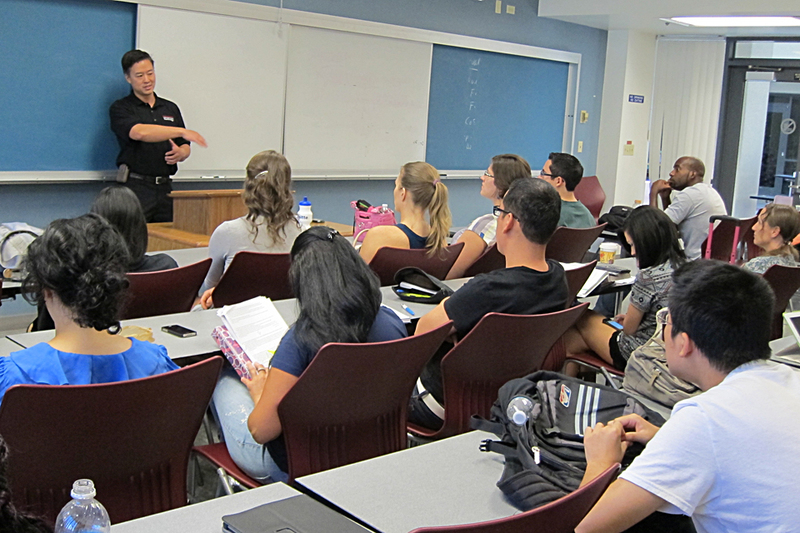 Peter Soh ’91 (Business and Economics) speaks to a CSUN accounting class about how he went from sitting in their seats to becoming a principal at Advise LLP, a company that offers accounting, tax and financial services to small to medium-sized businesses. Today, Christopher is a partner and senior analyst at Crowell, Weedon & Co. He decided to participate in CSUN’s recent “Professor for a Day” program to help students see the real-life application to what they’re learning in the classroom. “I wanted to give students real-life examples of how they will need what they’re learning in their careers and also point them to additional resources that are useful,” Christopher said. 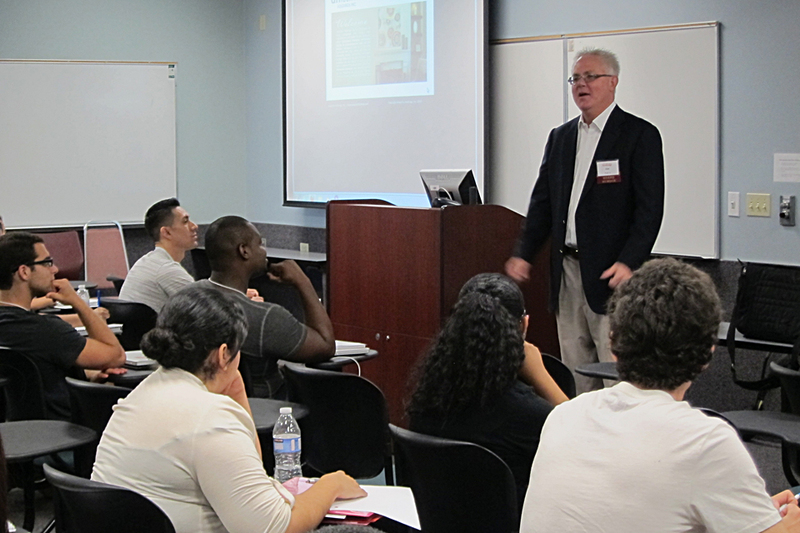 Christopher was one of more than 90 business leaders from Southern California who donned the title of “professor” as part of the fourth annual College of Business and Economics “Professor for a Day” program at CSUN on Sept. 19 and 20. 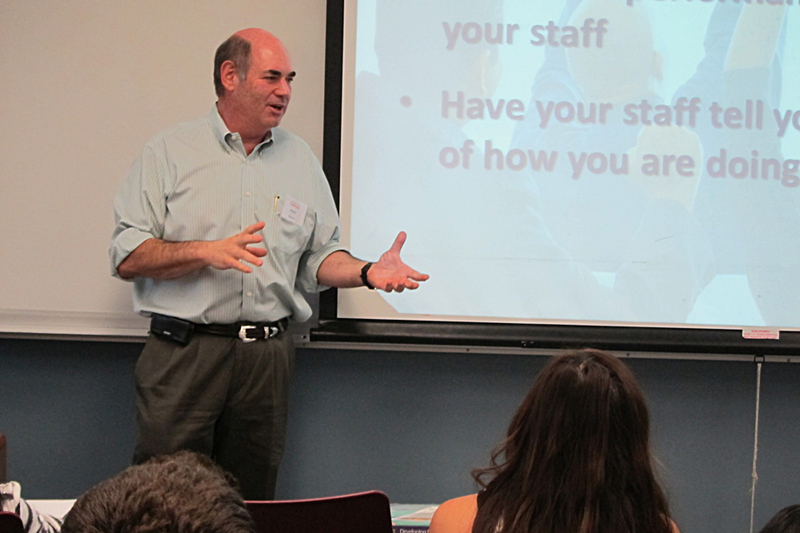 Christopher and the other participants shared useful advice and personal tes­timonies with students. The business leaders taught in each of the college’s departments: accounting and information systems; business law; economics; management; marketing, systems and operations management; and finance real estate and insurance. Nearly 4,000 students participated in the two-day event. Gil Breakman ’90 (Business and Economics) said when he was a student at CSUN, he was able to make valuable contacts and network through various fraternal groups and organizations. Today, Breakman is the vice president of accounting at Warner Bros. in the enterprise financial services area of the corporation. Other volunteer “professors” included Ken Floyd ’80 (Business and Economics), chief executive officer at Artissimo Designs; and Fred Nigro ’74 (Business and Economics) of Nigro, Karlin, Segal & Feldstein.